For different reasons, this recipe had to be on the blog asap! 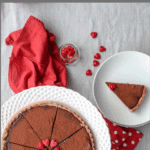 First, French chocolate tart. Just that, you understand what I mean. You can’t ignore it anymore. Also, I barely have any chocolate on the blog! What? Wait, how is that even possible? I love chocolate, everyone around me does too. There are always 2 types of chocolate in my house. So weird! The most recent one is a healthy chocolate recipe. At least that’s that! Anyway, I’m here today, to fix that. There you have it. A decadent, rich and chocolatey dessert. A few tips and comments to help you along with the recipe. The crust: It freezes well if you decide to prepare it and freeze it. Do not bake it. To bake the dough, if you don’t have any dry beans or similar to blind bake. Don’t panic and just poke the dough with a fork so it won’t rise. 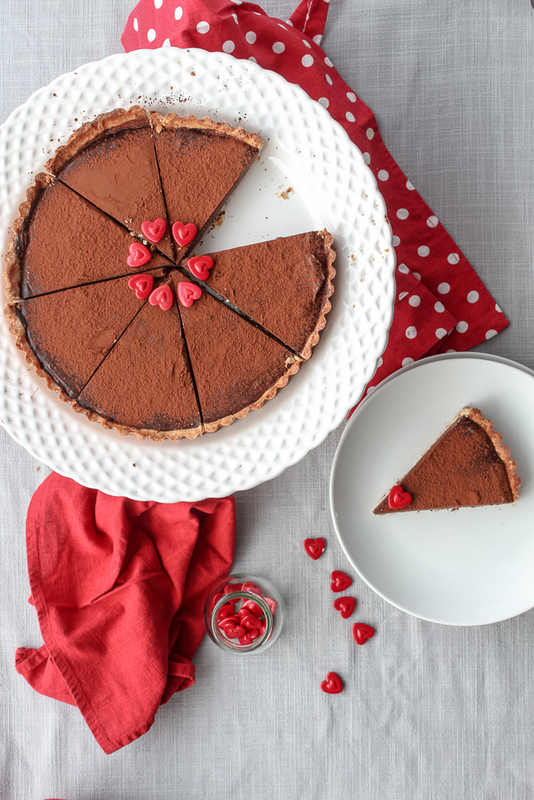 Protecting the crust: The step where you spread some melted chocolate on the pie crust is really important. It will protect your ganache from making your pie crust soggy. This step is even more important if you poked the crust. It creates a layer. The chocolate: You can adapt to your taste with another type of chocolate (like chocolate milk) but I would recommend an unsweetened chocolate. Also, a quality chocolate will be key to an amazing tart. Valentine’s Day is around the corner but let’s agree that you don’t need an excuse for a delicious, rich dessert. With a little organization because the steps are spread in time, you can make this easy dessert and impress your friends and family. The ingredients needed are mostly always in your pantry or fridge. I highly recommend making my recipes using a scale but for your convenience I have also converted the recipe using this website. In a bowl, sift the flour and add the butter cut in cubes. Preheat the oven at 325C. Roll the dough down, not too thin and put it in a 9 inch pie mold. Bake the crust blind (I use some parchemin paper placed on top of the crust and some dry beans for the weigh) for 20 min or until golden. With the melted chocolate and a pastry brush, spread the chocolate evenly on the pie crust. Allow to dry. Bring the cream to a boil. Add the chocolate and the butter. Stir until melted. Spread the ganache on the pie crust. What a delicious recipe, I love how easy this is! Tres bien!